Un trabajo de EUSME Centre, con la información y datos básicos de la evolución del mercado online en China. In order to control population control, in 1979 the Chinese government enacted a series of laws in order to give parents incentives to have one child and even greater incentives for having a son. 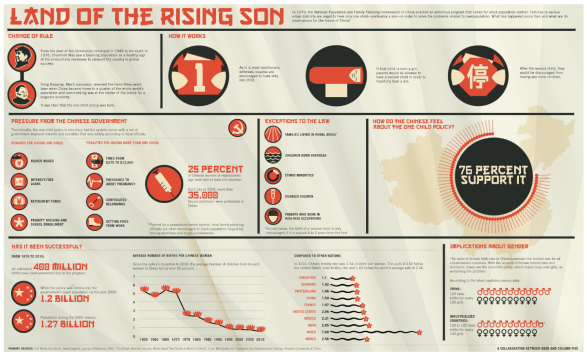 This infographic takes a look at what the results of that law has been and the implications it has had in China, ultimately was the law successful and how has it shaped China today. With over 55 million international arrivals in 2010, China ranks 3rd as the world’s most visited country. This handy infographic breaks down travel patterns for international arrivals to China and Chinese tourists abroad.